Having been mightily impressed by an earlier Steinway release – that of Stewart Goodyear playing his arrangement of Tchaikovsky’s Nutcracker – I was more than a little curious to hear this new one. It features the Hungarian pianist Gábor Farkas (b. 1981), who graduated from the Liszt Academy, Budapest, in 2006. Two years later he won the International Liszt Piano Competition, and has since recorded several Liszt albums for Warner. I was interested to discover that one of his mentors was the late Zoltán Kocsis, who was so closely associated with the music of that other magnificent Magyar, Béla Bartók. An added attraction of the Goodyear release was that it was recorded for Steinway by Sono Luminus, at their studios in Boyce, Virginia. SL certainly know how to record a piano; indeed, their recent album, America Again, was one of my top picks for 2016. This time Steinway have stayed in-house, but a quick listen suggests that this newcomer – engineered by Lauren Sturm – sounds just as accomplished. I’ve long admired Craig Sheppard’s fine Warner-EMI account of the Liebestod, and that’s my benchmark here. In Farkas’s hands Wagner’s harmonic ambiguities are as startling as ever, the playing seamless and alive with detail. The recording is full, rich and beautifully balanced, the closing pages thrilling in their poise and cumulative power. If this were a live performance I’d expect the audience to leap to their feet in wild approbation. I still admire Sheppard’s Liebestod, but the Farkas is now my go to version of the piece. Yes, it really is that good. In a recent online debate the consensus was that Liszt was better at arranging other people’s music than he was at writing his own. Perhaps, but after listening to Totentanz – originally written for piano and orchestra – such assertions seem barely credible. Farkas takes control of this diabolical dance from the outset, its swirl and thunder superbly realised by all concerned. Any caveats? Some of the quieter moments may seem a little studied, but otherwise this pianist’s control of touch and dynamics is masterly. As for the Dies irae – heard in many guises, some quite subtle – it’s nicely highlighted throughout. Actually, the more I listened to Farkas’s Totentanz the more remarkable it seemed. This isn’t a wunderkind out to impress; no, there’s a certainty of shape and a depth of imagination to this man’s playing that speaks of a talent far beyond his years. That’s also true of the Faust paraphrase, where the waltz is given a gorgeous lilt and the music-box-like tinkle of what follows is so delicately done. Farkas is unfailingly articulate and proportionate, both here and in the themes from Verdi’s Aïda; in fact, the latter’s light- and life-extinguishing duetto final has never moved me this much before. So, feeling is most definitely part of this pianist’s repertoire, and that’s most welcome in music where technique is apt to dominate. Farkas is adept and sensitive when it comes to miniatures as well; rarely have I heard the Chopin and Schumann so attractively scaled, their colours so subtly shaded. Fluidity and fluency are very much to the fore, every bar imbued with a lovely Romantic blush. The booklet essay is by Jens F. Laurson, who contributes to these pages from time to time. He doesn’t discuss the works played, but then this is one of those albums where all you need to do is listen. 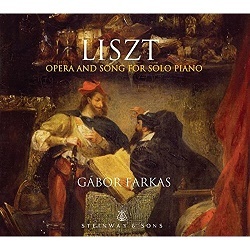 Farkas is a first-class Lisztian; the recording is top-notch, too.